According to 2016 figures from the World Health Organisation, diabetes is a worldwide pandemic with a staggering prevalence of 422 m diabetics and the disease has increased fourfold over the last 25 years. The disease can lead to cardiovascular disease resulting in the reduction of quality of life for the patient, increased risk of death and staggering healthcare expenses. Approximately 90 % of all diabetics suffer from type 2 diabetes, whilst approximately 10% suffer from type 1 diabetes. The pandemic rise in the prevalence of diabetics is expected to result in a considerable growth in anti-diabetic agents, rising from close to $70 million in 2016, to more than $185 million by 2023. Approximately half of this market attributes to oral anti-diabetic agents (tablets) whereas the other half of the market attributes to injectable treatments, like insulin and GLP-1. TRPV1-antagonists are substances that can temporarily block the activity of the ‘chili-receptor’, TRPV1. TRPV1 is highly preserved throughout species and is found both in the central nervous system as well as on peripheral nerves, predominantly on sensory nerves that are designed to react to injury and to transmit signals of pain and promote local inflammation. TRPV1 has been studied intensively in the area of pain management as a potential target to control chronic pain as a supplement to pain killers like ibuprofen and paracetamol prior to the transition to opioid painkillers (with side effects such as dependency). A number of potent, small molecule TRPV1 antagonists have already entered clinical trials for indications like pain and cough. Based on available public data and to our knowledge, five assets are currently in clinical development, six assets have been discontinued for reasons other than safety, three assets have been discontinued due to undisclosed reasons and two assets have been discontinued due to safety problems. To the best of our knowledge, the reported safety problems related to hyperthermia seem to vary within the drug class from serious to insignificant. XEN-D0501 has been found to have a moderate and transient effect on hyperthermia – an effect that we have judged within the absolutely acceptable range. In animal models, the concept that diabetes may be treated with a TRPV1 receptor antagonist has been validated by both direct and indirect means (own studies and literature data). The first direct preclinical proof of concept was provided in 2004 by then Research Scientist at Novo Nordisk, Dorte X. Gram; subsequently leading to the submission of a use-patent application by Novo Nordisk. Later, other research groups from Astellas Pharma in 2011 and from Astra-Zeneca in 2015 have published data that support the hypothesis that TRPV1 antagonists improve both insulin secretion and insulin sensitivity and thereby might become novel oral anti-diabetic agents. Despite a large number of preclinical scientific evidence for a role of TRPV1 in metabolic disorders, there is no consensus amongst diabetes specialists for a role of TRPV1. To the best of our knowledge, none of the TRPV1 antagonists in clinical development have been assessed for their eventual anti-diabetic effects in man. 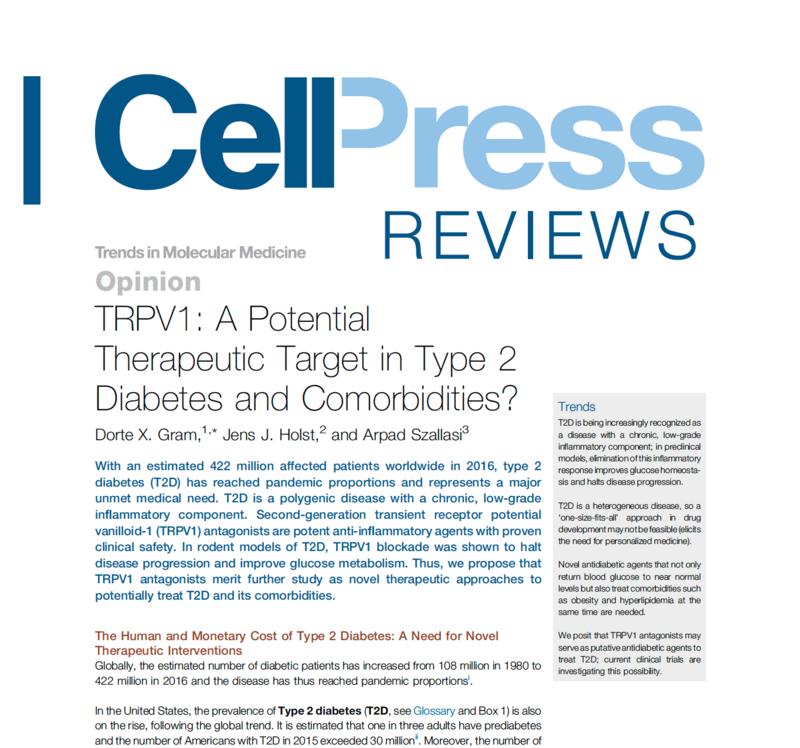 We are extremely proud to inform you that, as of today, our Opinion and Concept Paper on the role of TRPV1 in diabetes is finally published in Trends in Molecular Medicine!